City officials want to know if residents would support an increase in the city sales tax to pay for improvements to its main thoroughfare, which they say is “dire need” of help. During their Aug. 18 work session, members of the Apache Junction City Council discussed the city’s efforts to educate residents about a proposed improvement project for Apache Trail between Meridian and Idaho roads. That stretch of the thoroughfare, according to a fact sheet being distributed by the city to residents, is in “dire” condition. The city estimates the cost to improve the roadway is $3 million, or $15 per square foot, Assistant City Manager Bryant Powell told council members during the Aug. 18 work session. If the city decides to postpone the improvements, the cost could increase by 2020 to $12 million, or $55 per square foot, Mr. Bryant said. Historically, road improvements in Apache Junction are funded by Highway User Revenue Funds, according to the city’s Apache Junction Public Information Plan created in June. HURF comes from the gas tax collected by the state of Arizona. Since 2007, HURF funding has decreased in Apache Junction from $7.3 million to $3.8 million, according to the fact sheet. Apache Junction has an 8.9 percent city sales tax, according to a press release from the city. Of that, the city receives 2.2 percent, the state receives 5.6 percent and Pinal County receives 1.1 percent, according to the release. If an individual spends $100 in Apache Junction, the state receives $5.60, the county receives $1.10 and Apaache Junction receives $2.20, according to the release. A .2 percent city sales tax increase would result in Apache Junction receiving $2.40 — an extra 20 cents — for each $100 purchase, according to the release. The increase does not have to go to a public vote, City Attorney Joel Stern said to the council, according to the video. Mr. Stern told council members they could take the matter to the voters but doing so could delay the project. A delay could increase the project cost and incur the cost of a special election; the latter costs about $30,000, Mr. Stern said. The plan and a fact sheet about the proposed road improvement project can be viewed online. The plan calls for elected officials and staff members to meet with businesses and residents along the Trail as well as neighborhood leaders and associations, social and civic organizations, local school and fire districts, churches and city board and commission members to share information about the proposed city sales tax increase and road improvements and then gather input to report to the council. So far, the city has reached about 2,750 people through its presentations, e-mails, social media, events and conversations, Mr. Bryant told the council, according to a video of the meeting. The video of the work session can be viewed online. Presentations will vary depending on the desires of the audience and the electronic facilities available at the meeting site, Mr. Powell said during a phone interview Aug. 21. All attendees receive a fact sheet that the presenter explains, he said. Those with access to the Internet can also view a video produced by the city that explains the need to improve the roadway, Mr. Bryant said. He also can e-mail a link to the video to interested parties, he said. “The general feedback is to fix the Apache Trail,” Mr. Bryant said during his work session presentation. He said people also are asking which roads would be fixed after the Trail. Topping that list, he told the council, is Delaware Drive, which requires paving and improved drainage between Broadway Avenue to Southern Avenue. Next are paving the following roads: Southern Avenue between Apache and Winchester, Baseline Avenue from Meridian to Winchester and Broadway Avenue from Old West Highway to Tomahawk, he said during his work session presentation. Construction could begin as early as summer 2015, according to the information plan. Council members asked Mr. Bryant to prepare additional information for review at the council’s Sept. 2, which will begin at 7 p.m. in the council chambers, 300 E. Superstition Blvd. Vice Mayor Robin Barker requested the discussion also include information about an existing .2 percent sales tax that will sunset — or go away — in October 2016, according to the meeting video. The tax was implemented to fund soft capital such as city vehicles and facility maintenance, Mr. Bryant said on the meeting video. Mr. Powell recommended council members continue their discussion at their Sept. 15 work session and hold a public hearing and possible vote at their Oct. 7 regular meeting, he said during the Aug. 18 work session. Both meetings start at 7 p.m. in the council chambers. The meeting dates may change at the council’s discretion, Mr. Powell said during his interview. For more information, call 480-474-5080. Please go to your polling place and VOTE! It is absolutely essential that you do. Vote for whomever you choose, but VOTE!! 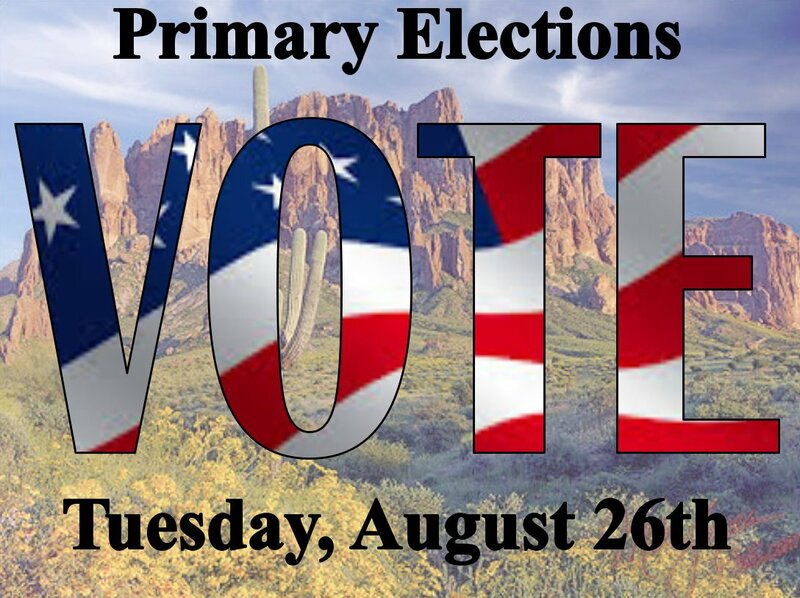 Our Primary elections take place here in Arizona on Tuesday, August 26th. PLEASE go to the Polls and VOTE. I have included a video below to give you something to think about. America Buying a Border Fence for Ukraine as DHS Says Border Fences Don’t Work? Only in the United States could the enumerated powers and responsibilities of the Executive Branch be ignored by the “president” while he simultaneously provides those same protections to foreign countries around the globe. The latest instance of our federal hypocrisy is occurring now, in the standoff in Ukraine. Hussein Obama’s State Department has granted a contract for the delivery of 2,500 spools of Concertina wire to the government of Ukraine for the purpose of securing their border with Russia. Of course, that is a tactic that only works outside of North America. On our continent, border fences are mysteriously ineffective. At least, that is what those who are supposed to be protecting our nation have repeatedly told us. THESE ARE OUR U.S. SENATORS FROM ARIZONA? IT’S TIME FOR THEM TO GO. A man whose time has long passed. 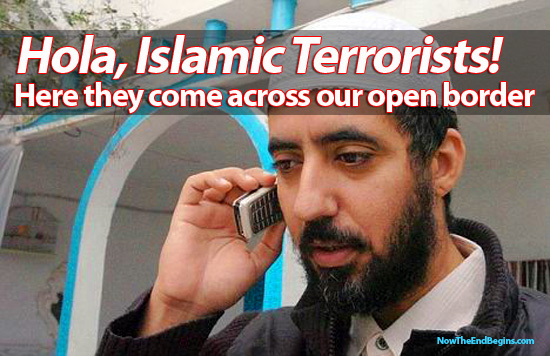 The level of U.S. government involvement in the invasion plaguing the Republic is staggering. Once we scratch beyond the mainstream media’s shallow surface we find layers upon layers of treason. And even with the layers of treason and direct fault at the foot of the government, Congress does absolutely nothing to address it or represent the will of the people. Unfortunately, thanks to John McCain and Jeff Flake, it’s all about to get much worse. The two are about to begin heavily pushing a disastrous $100,000,000 bill that not only does nothing to secure the border, but actually makes it easier for more illegal aliens to flood the nation. 2) Asserts acts that are already illegal are now illegal. 3) Makes it a federal crime to tell someone where a DHS, HHS or Border Patrol bus carrying illegal aliens is spotted, coming from or headed. 4) Makes it a federal crime to prohibit a DHS, HHS or Border Patrol bus from moving from point A to point B. 5) Does absolutely nothing to secure the border and stop the invasion in Texas, New Mexico, Arizona and California. These southern borders will remain wide open and the bill doesn’t address this. 6) Creates a communication channel between HHS and states about newly recommended facilities for housing illegal aliens. 7) Opens up U.S. facilities in Guatemala, Honduras and El Salvador for the purpose of processing illegal aliens on foreign soil. 8) Calls for 15,000 “refugees” from Guatemala, Honduras and El Salvador to be processed on foreign soil and transported into the U.S. this year alone.